Sony Online Entertainment has added a microtransaction shop to DC Universe Online. Subscriptions alone just don't seem to cut it in MMOs anymore. Players of DC Universe Online might need to get a second job in addition to working alongside Superman and Batman, with the recent launch of a cash shop in DC Universe Online. The superhero MMO is not the first to feature in-game microtransactions, though MMOs typically will go for the subscription or microtransaction-based model. DC Universe Online's cash shop is pretty bare-bones at the moment, but gives an idea of what to expect in the future. There are categories in the shop for both style and supplies, though only supplies are currently available. Players can buy Proto Repair-Bots for $1, or Vault Tickets for $1 (with a 5 for $4 discount). Repair-Bots fix up your equipment while on the go, and Vault Tickets are used to give access to an otherwise once-per-day loot mini-game. 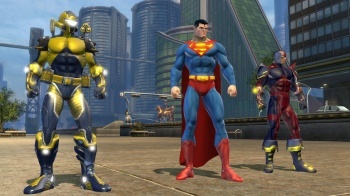 Sony Online Entertainment launched DC Universe Online on the PS3 and PC in January. There had been plans to launch an in-game microtransaction shop for a while, so don't take this as an indication that the game is going free-to-play just yet. However, with nearly every other non-World of Warcraft MMO going free-to-play in the current climate, I wouldn't be surprised if it goes that way eventually.